Since 1 Million Cups Rochester launched in Rochester, Minnesota in February 2017, the organization has provided a platform for thirty-two emerging startups and businesses to share their story. This educational opportunity offers a supportive environment for entrepreneurs to learn and grow their business while gaining feedback and support from the local community. 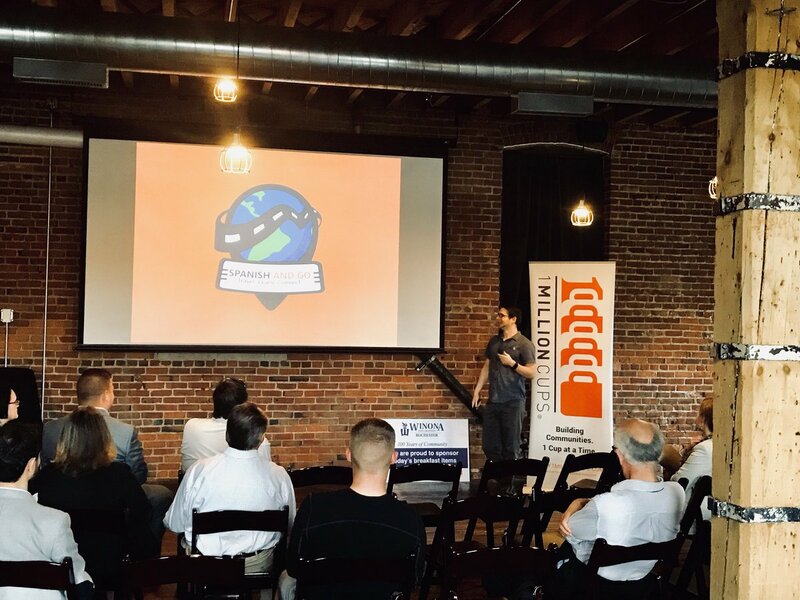 A regional startup less than five years old with an innovative new idea or an established business that is launching a new disruptive product can apply to make a 1 Million Cups presentation. 1 Million Cups Rochester meets at 9:00 a.m. on the first Wednesday of each month in the event space at the downtown Rochester Bleu Duck Restaurant in Discovery Square. At each session, two different entrepreneurs talk about their business to an audience of business owners, students, and community members. This is not a sales pitch nor is it a place to seek funding. Instead, it’s an opportunity to gain valuable feedback about a business or business idea. Each presentation includes a six-minute talk followed by twenty minutes of questions and answers during which the audience helps the entrepreneur think about their business in a new way. Each presentation ends with the question “What can we as a community do for you?” This allows the audience to leverage their resources to support entrepreneurship and help local innovators move forward with their companies. “1 Million Cups Rochester is another key piece of the growing entrepreneurial environment within Destination Medical Center (DMC) Discovery Square,” notes Chris Schad, Director of Business Development – Discovery Square for DMC Economic Development Agency. Originally developed by the Kansas City-based Kauffman Foundation in 2012, 1 Million Cups has since spread to over 180 different communities across the United States, including seven communities in Minnesota. With the goal to “caffeinate an entrepreneurial nation,” each 1 Million Cups event is free and open to the public, with plenty of coffee available to fuel ideas and conversations.